Interesting that while trying to straighten out the financial disaster inherited from the Bush Administration, President Obama is chided constantly by members of that administration and its supporters to forget about that and move on, even as those supporters continually vote against anything that might help the American people and end the mess. The past is the past, they like to point out. Stop blaming the Bush administration for the bad things they did. Oh, and while you are at it, ignore the games we are playing now to make sure you fail. Bad things should just be left alone. 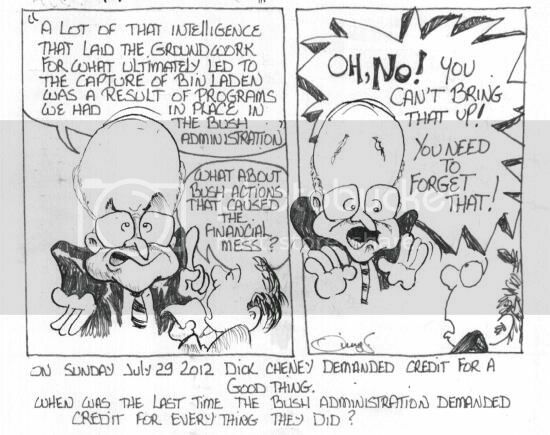 But when it comes to a good thing, like getting Bin Laden, who was killed and not captured as Cheney says, Credit MUST be given to the Bush Administration. Why is it that all the bad things should be forgotten and blame not laid on those responsible, but we must give credit for what they want seen as a good thing. Aren't they just as much out of office in either case? If they want credit for good things, they should accept credit for their screw ups too. Isn't that the mature, adult, responsible thing to do?